The Best Western International Speedway is located within walking distance of Daytona International Speedway. It is adjacent to more than 75 restaurants and shops with convenient access to both I-95 and I-4. The hotel boasts six tennis courts, Olympic-size pool and fitness center. This Daytona Beach, Florida hotel offers thoughtfully-appointed guest rooms, each complete with 42-inch flat screen HD television and free wireless high-speed internet access. All rooms feature a balcony, refrigerator, coffee maker, hairdryer, iron and board. Business guests appreciate our six meeting rooms with over 4,000 square feet of meeting space, conference services and a business center with Internet access, fax and copy service. We are close to area businesses, including United States Tennis Association, Ladies Professional Golf Association, MASCO, Halifax Hospital and Jehovah Witness. Plus, we are adjacent to the Indigo Lakes Golf course in Daytona Beach. 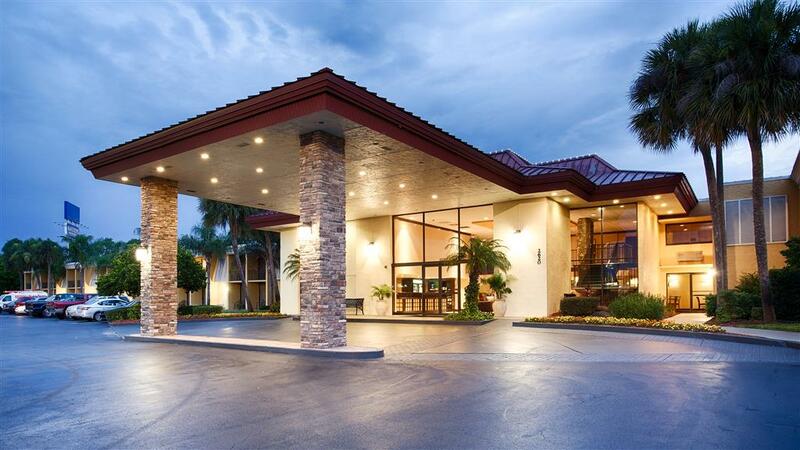 Our hotel's leisure guests love our location because they are just two miles from Embry Riddle University, Daytona State College, and there is easy access to Bethune Cookman University. Guests can enjoy an evening performance at Peabody Auditorium or Mary McLeod Bethune Performing Arts Center. Families love to visit the exciting Daytona Lagoon Park, as well as the 22 miles of the "World's Most Famous Beach". We are pleased that we are the preferred Daytona Beach hotel for the Daytona Beach Kennel Club and Poker Room. For a unique, comfortable and enjoyable experience, make a reservation at the Best Western International Speedway. Enjoy your stay. Buffalo Wild Wings: 0.40 mile(s) from Buffalo Wild Wings, bar/lunge, American, open for: lunch, dinner, restaurant menu includes salads, wings, chicken tenders, shrimp, flatbreads, wraps, fish tacos, burgers, sandwiches and desserts. Five Guys: 0.80 mile(s) from Five Guys, fast food, American, open for: lunch, dinner, is a fast casual restaurant chain focused on hamburgers, hot dogs, and French fries. Camping - 17.00 mile(s) from Tomoka State Park, camping, hiking, boating, and picnicking available. Horseback riding - 7.40 mile(s) from Tiger Bay State Forest, recreational activities include hiking, bicycling, horseback riding, picnicking, boating, fishing, hunting, nature study and photography. Outdoor tennis courts - Tennis courts, property has six outdoor tennis courts. From: Daytona Beach International Airport. Turn right onto Midway Avenue. Turn left onto International Speedway Boulevard. Turn right on Indigo Drive. Make immediate left and the Best Western International Speedway is on the right. From: Orlando. Take I-4 East. Take the exit on the left onto I-95 North toward Jacksonville. Take Exit 261 for US-92 toward Deland/Daytona Beach. Keep right at the fork, follow signs for dog track/Speedway Boulevard/beaches and merge onto US-92 East/West International Speedway Boulevard. Turn left on Indigo Drive. Make immediate left and the Best Western International Speedway is on the right. From: Jacksonville. Take I-95 South. Take Exit 261A to merge onto US-92 East/West International Speedway Boulevard toward Daytona Beach. Turn left on Indigo Drive. Make immediate left and the Best Western International Speedway is on the right. Angell & Phelps Chocolate,5.30 mile(s) from Angell & Phelps Chocolate, a Daytona tradition since 1925. This gourmet chocolate factory specializes in making chocolate by hand. Ocean Walk Shoppes,6.60 mile(s) from Ocean Walk Shoppes, offers unique shopping, dining, and entertainment. Bethune-Cookman University,5.80 mile(s) from Bethune-Cookman University, a United Methodist-related institution. Embry-Riddle Aeronautical University,4.30 mile(s) from Embry-Riddle Aeronautical University, the curriculum covers the operation, engineering, research, manufacturing, marketing, and management of modern aircraft and the systems that support them.